Find the best balance of process fit, IT functionality, and ease-of-use in the mining and resource industry with SYSPRO Enterprise Resource Planning (ERP) software installed on premise or in the cloud. For more than 35 years SYSPRO has remained a leader in the ERP space by listening to the needs of customers, anticipating industry and technology trends, and continuously evolving the software’s functionalities based upon these needs and trends. Today, SYSPRO is a globally-recognised ERP supplier with thousands of customers in more than 60 countries. Mining and resource operations often exist in remote or poor infrastructure areas, and the complexity of these operations manifests in a number of areas: visibility, data reliability, functional silos, accessing and managing high volumes of data, and grade control, among others. SYSPRO recognises the challenges of implementing, using and maintaining software systems in this sector, lack of skills to implement and support systems; lack of operational skills, particularly with regards to use of IT; level of complexity, functionality, and ease of use of systems; and the cost vs. the benefit (or RoI) of IT in such environments. The ability to get end-to-end operational visibility and accurate data proves to be a challenge in the mining and resources sector. Scalable for rapid growth SYSPRO is designed with the ‘keep it simple’ principle and is an ideal fit for both simple and complex supply chains. SYSPRO’s global footprint enables multinational customers to use SYSPRO not only in the head office, but also in smaller divisions elsewhere, allowing the business and employees to operate as a cohesive unit. SYSPRO’s ‘buy what you need when you need it’ philosophy enables customers to add on to the core solution as and when the need arises, whether this is for additional functions, or additional users. This unifies into a single vital ecosystem that serves to nurture customer interaction, develop long-term relationships and, most important, mitigate risk. With the SYSPRO approach of ‘Simplifying your Success’, the total cost of ownership (TCO) is kept manageable while value is maximised. The TCO is measured over a period of time and includes the cost of hardware and software purchase, software maintenance charges, initial implementation consulting charges, and on-going technical and business support and training. There are also the less obvious costs like employee time to perform transactions, learning the system, travel costs for specialist help, system administration costs, and network and infrastructure charges and reliability. Using SYSPRO ERP keeps the solution strong but not overly complex, easier to use than available solutions targeted at very large user numbers; and faster to implement by keeping processes simple. There is constant demand on technology to help businesses be agile and to perform at maximum efficiency. SYSPRO has the flexibility to meet these constantly changing economic and unpredictable business requirements by providing stability, innovation and right-time technology solutions. Companies selecting SYSPRO gain more than a software solution. They are able to leverage SYSPRO’s software expertise, obtain periodic software upgrades that further SYSPRO technology leadership, and enjoy an ongoing relationship that has at its core the success of the customer. An appropriate IT roadmap into the future ensures as the operation and users become more disciplined with using SYSPRO ERP, that more complex IT can be introduced or integrated to the SYSPRO solution, and enable business analytics, advanced planning and logistics. SYSPRO Software was named the winner of a Gold Stevie® Award in the Supply Chain Management Solution category at the second annual Asia-Pacific Stevie Awards today. U.S. Salt is a major salt producer serving customers across industries, from food to pharmaceuticals and technology. SYSPRO 7 is the latest version of SYSPRO, the enterprise resource planning (ERP) software that enables companies to optimise and improve their business processes. 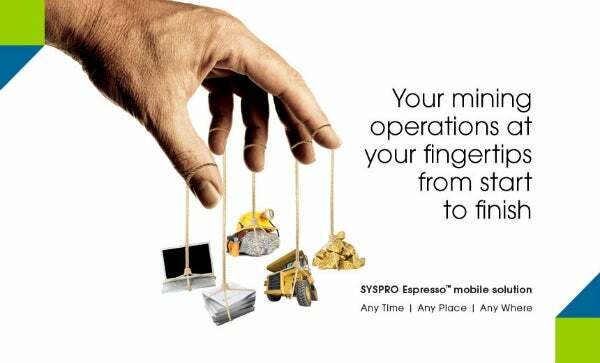 SYSPRO Espresso is a mobile solution that gives you access to your business processes and data as easily as if you were in your office. It enables you to use applications that will work any time, any place, and on any popular device, providing instant and secure access to information about your customers, suppliers, inventory items and other key business information. SYSPRO systems were installed at Rosh Pinah Zinc Corporation to increase efficiency, simplify the business, reduce costs and automate where possible. SYSPRO was selected by Mopani Copper Mines (MCM) to expand its business functionality and deployment capabilities. Download Syspro's free paper on how to optimise inventory to gain better supply chain management. Syspro offers businesses the opportunity to improve their supply chain processes using sophisticated yet ease-to-use technology. SYSPRO 7 is the latest version of SYSPRO, providing customers with greater business value through extended scalability, mobility, simpler business interactions and performance, and streamlined business processes. With commodity prices under pressure, the future of mining depends on accessing real-time information for quick management decisions. Financial and non-financial reporting is now the difference between a profitable mining future and no future at all. A provider of best-of-breed, award-winning enterprise resource planning (ERP) software for on-premise, mobile and cloud-based utilisation SYSPRO has announced that Supply & Demand Chain Executive Magazine has included SYSPRO it its listing of the Supply & Demand Chain Executive 100. Developer of best-of-breed, award-winning enterprise resource planning (ERP) software for on-premise and cloud-based utilisation, SYSPRO today announced that Ann Grackin, CEO of ChainLink Research, has in a recent report cited the benefits of SYSPRO's organically built, end-to-end, single-source ERP solution.